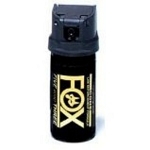 Striking appearance with wide-mouth activator flip top to prevent accidental discharge. We are talking serious, effective less-lethal stopping power! 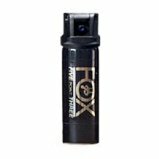 Note: FOX LABS does not use tiny nozzle openings that reduce the amount of formula discharged per burst. Other companies do this so they can make claims about more bursts per unit for reasons of marketing to make their products sound better to those who dont stop and think about what this actually means. The reality is that 2, 3 or 4 ounces of formula is the same volume regardless of whose canister it is in, so the only way to get more bursts from a canister is to reduce how much formula is being discharged per burst. FOX LABS units discharge as much of their famous formula as possible per burst to make sure you have an opportunity to stop the assailant/s as quickly as possible.